Description: "The Principles Of Correct Practice For Guitar” (often called "The Holy Grail Of Guitar") has become famous with guitar students and teachers around the globe. 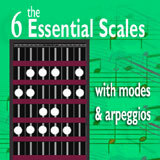 It is THE most essential book for every guitar player, and is applicable for all levels and all styles. "The Principles" is a scientific guitar method that uses the laws of body mechanics to train your fingers to play the guitar. It is the only method based on the scientific laws of how the body learns, and when you are learning guitar, you must follow these laws. "The Principles" will give each hand a firm foundation of technique, as well as teach you how to practice and get solid results from every practice session. "The Principles" is the key to all your future guitar growth! "The Principles" teaches beginners how to avoid all the usual problems, and shows long-time players how to get rid of the problems they have developed from years of incorrect practice. Anyone can learn to get the kind of results professionals get by using the "Principles". You will find out what CORRECT PRACTICE is...the way of practicing which actually makes you better each time you do it! 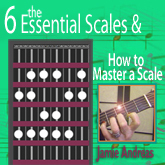 No other book explains so clearly and so completely what you need to know, and what you need to do to really train your fingers to play the guitar well. "The Principles" method builds the solid foundation of technique that will enable you to work all the way to mastery of this instrument, if that is your goal. "The Principles" applies to ALL STYLES.....Rock, Classical, Folk, Jazz, Blues, Heavy Metal, Acoustic...they all use the same fingers to play the notes, and the way we develop and teach the fingers is essentially the same for all styles. 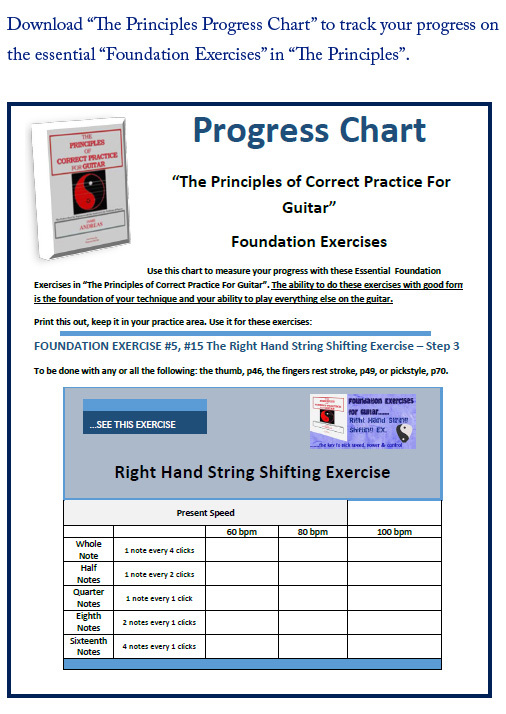 Whatever your musical interest, "The Principles" teaches the fundamentals of training the fingers for fast and easy movement on the fretboard. "The Principles" is composed of three elements. There are 26 Foundation Exercises (specific routines) to be done during practice, that will build technique (playing ability) in a step by step fashion, each step building on the previous one, and preparing for the next. There are 34 Understandings (concepts) which you must understand in order to begin to practice effectively, and 7 Tools (practice approaches) to be used to solve problems in playing. These approaches are based on certain key Understandings, such as Muscle Memory and Sympathetic Tension, as well as the true nature and function of Attention and Awareness during the practice process. How playing the guitar can become an entirely new experience! What seemed hard (because you were really fighting your own "locked-in" muscle tension) will now be, and feel, EASY! This is just a fantastic book. I was learning guitar for 3 years without advancing, everything changed with the book. Jamie Andreas is a dedicated teacher who makes you understand how to practice efficiently, how to control every movement of your fingers, of your arms, of your shoulders, how to breath between the notes. The results come fast and you can feel it and enjoy it. At the end, I decided to take skype lessons with Jamie. I have never seen a teacher paying so much attention to what the student is doing, and putting so much effort to make it work nicely. Playing music becomes so wonderful! Thank you. USE this Book and you WILL improve! 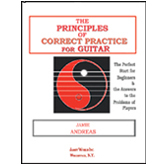 I have stacks of books dating back to the early 70's on music and guitar instruction, but this book "The Principles of Correct Practice for the Guitar" is far and away the absolutely best guitar instruction book I have ever owned. This is the book that will teach you how to use all your other books. I first bought the book many years ago and kind of ho-hummed as I read through it. Then I threw it on top of the stack of all my other guitar books and there it sat. Months later, (it may have even been a year or two) I found myself in the pits of frustration and at a hellacious sticking point. My playing had improved only marginally and I could see no way out. with my motivation shot, I began thumbing through my stacks of books. When I got to this one I decided to pull it out and maybe even give Jamies methods a try and see what happened. Well, this meant to actually DO the exercises recommended, in a conscientious manner and exactly as instructed. In desperation I decided to do so and thank God I did! Once I began to actually DO the exercises in a strict manner I got immediate results as I began to unlearn bad habits and dissolve ingrained knots of tension that previously I didn't even know existed. I give this book my highest recommendation. As other reviewers have said, and I totally concur, this is a book that must be USED, and not merely read. There is a gold mine of information in the book that I never realized until I began to put the "principals" to work in a religous and exacting manner. As soon as I put it to USE my playing abilities began to soar and flower in ways I could never have imagined, and it continues to this very day. Any sticking point I find myself in these days becomes an exciting adventure in discovery. A couple years ago I had to purchase another copy because that old original I had became so "dog eared" with pages falling out that it was basically destroyed. 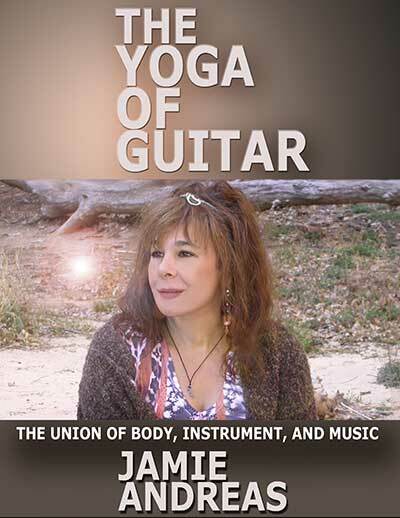 This book is a classic in the truest sense of the word and I am convinced that guitar players for generations to come will heap praises on jamie for publishing this innovative and ground breaking work. I can see NO possible reason for a negative review other than #1 They ARE Dave Gilmour (no offense to dave) or #2 because the book was perused and not USED. Hats off Jamie! Great job!!! Very clear guidelines to aspire to. IT IS A VERY GOOD BOOK TO LEARN HOW TO PLAY THE GUITAR PROPERLY! tHANK YOU SO MUCH FOR ALL THE VALUBLE INFORMATION I COULD NOT HAVE GOTTEN ANYWHERE ELSE! Bought this on the recommendation of a friend who, like me, is a guitar lover. 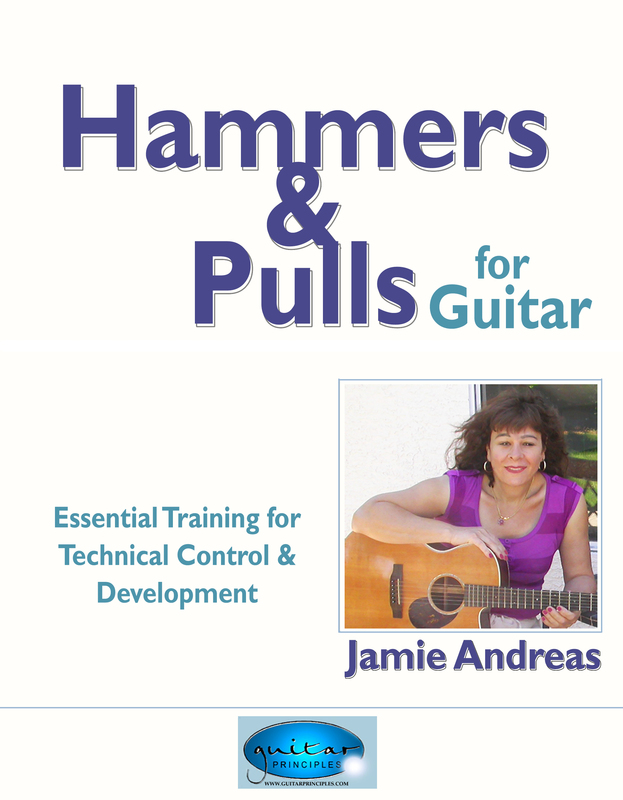 This book is easily the best PRACTICAL instruction manual I have ever had - Ms. Andreas clearly explains why so many players encounter problems with learning the guitar. The problems have so much to do with the physical handling and holding of the instrument - and she gives clear simple instruction and advice in how to correct the issues. This book covers material that no other guitar book that I'm aware of covers. It's doesn't so much teach you how to play but how to play correctly with proper technique; how to keep your body relaxed as you play. I wouldn't want to be without the material in this book. 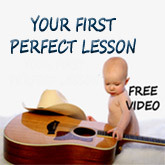 This brought a simple strategy to learning how to practice guitar, which some concepts can be applied to any instrument you would like to learn. I am just beginning to take guitar lessons and I was amazed at the sessions (on-line course) dealing with the parts of the guitar, the fretboard, notes, etc. None of the lessons dealt with how to use your fingers on either hand or how to change strings with either hand. This book devotes chapters to those mechanics. And I like that it is written with a subtle taste of Eastern philosophy. It is meticulous and the exercises are repetitive but it builds a solid foundation for playing the guitar if you practice. The book is based on practice techniques not on playing. A good read for beginners and I would think for veterans who want to improve their technical skills. The holy grail. A fantastic guide which will make every guitarist a better player, almost guaranteed. If you can follow this simple advice, you will advance greatly. Excellent book on the correct way to practice. Step by step approach to the things your guitar teachers never told you. Proper posture, hand placement, pick holding, attitude exercises, its all there. Highly recommend this book and DVD. How you SHOULD learn to play the guitar.. I haven't written a review on Amazon before and typically when reading reviews of products I skip the long ones! This, unfortunately, is a long one. But my appreciation of this book is such, that I felt compelled to write a review and also to write one that was thorough. So, in advance: apologies for the length! I first picked up the guitar as a teenager about 15 years ago. Throughout the years, I've purchased many guitar books. I was originally self-taught and only recently did some guitar lessons. Of all of the guitar books that I've come across, "The Principles" is hands down the best book I've ever used. All other books I attacked with an initial vigorous enthusiasm that I thought could never be sated. But sated it usually was; and the books sat on the shelves after having only gone through a chapter or two. This book was different. It is the only guitar instruction book that I read from cover to cover - literally. Everything in the book makes sense. Jamie has stripped back everything and opened my eyes to what playing the guitar should FEEL like. There is (I believe) an important dichotomy to be understood with regard to this book: in a way, I wish I had started learning guitar using this book as it instructs you in the correct way to practise right from the very beginning. However, if I'm to be honest, when I first learned the guitar there was an impatience to want to learn more and more, faster and faster. This - I now realise - is the wrong approach. In order to become a great guitar player (not that I am one!! But I firmly believe that I never could have become one without this book. Now I'm slowly - delusionally? - starting to believe...), it is now evident to me that you must go back to the basics and get them nailed. Then develop your guitar playing slowly, gradually. This book has renewed my passion for playing the guitar. I bought it about a month ago, finished it very quickly, and am now practising guitar every day. (Previously I would have picked it up once a week, if that...) I even get up an hour and a half earlier every day (well... most days...!) to practise. The principles are there. They're in this book. It has broken everything down into slow and simple. In my (revised) opinion, this is the best way to learn the guitar. New to the guitar? This is the way to learn it. An intermediate player? (As I THOUGHT I was...) This is the way you SHOULD have learned the guitar. Either way: buy it - you won't regret it. I am currently reading the book. However, I can already say that the material is very well presented and is quite useful. While the subject of guitar playing may seem to be at great odds to the subject of martial arts; the concept of muscle memory is not. I have trained for over 25 years in serious martial arts, the principles outlined in this book regarding relaxation/slow movement to program muscles is very effective. I would rate this book a must have for any serious student of guitar. I first bought this book before I entered a music school. I read it and find it great with all the wise idear about how you should practise and be with your guitar. After I spend one semester working and practising hard, nothing was coming. My level was the same, I was struggling with the guitar and could not do a lots of things. In fact, the only thing I could do was create frustation with myself. My progress were short. I read back this book one month ago. Everything has changed. The value inside is not easy to describe. Not easy to state the change it made. I've had seven teachers before I came to this book. And no one ever explain to me the principles which are in this book. Briefly, the clear text (very well written) dissect all aspects of how your fingers move ; the fingers'arm'shoulder' relationship. How you have to seat and listen your body while you practise or play, how you have to focus with your mind about the things happening while you play. And it is only one part of all the vasts topics covered. This book is written by a dedicated person ( great virtuose) who has been taught over twenty years (I don't know maybe more) and have seen over 2000 guitar'studends. the author explain how works the fingers, the hands, the muscle memory and how you can work with and be with and train them. This is something I think 90% of the guitarist on earth are not aware of. 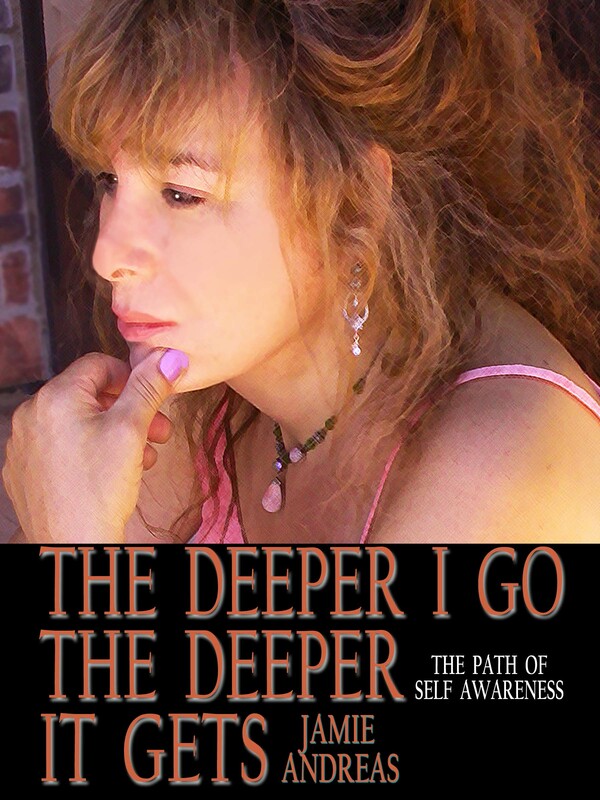 I did some boudhist meditation for a couple of years, before I came accross to this book. So I was quite happy to start focus'exercices through guitar. So I can say I am use (a little bit) to focus on something and train my mind. I can understand why I went through the first time and never noticed what could de done with this book. I was not ready. I 've not been in all the method'books of the planet, but I possess quite a few and... what can I say ? It is a mix of the Alexander technique + Stanislavsky technique applied to the guitar. I would say ... music is love.... and this book uncovered everything in you body to make the music come. If you apply this principles, you can't failed but discover your failures or why you were stick. I have a recommendation that will save any aspiring guitarist a lot of time, money and frustration. Maybe you spent a lot of time and money like I have on various guitar instructional materials - books, DVD videos, Internet lessons and downloads, etc. and still are frustrated and disappointed with your lack of progress like I was. Sometimes even beginner lessons with an instructor are not as productive as they could be. The problem with all the content material is that it is woefully lacking in specific guidance about how to practice that will develop the physical ability to get the results you want to actually be musical. Playing the guitar is first of all a physical activity and we need guidance and specific instruction to develop the physical dexterity, strength and control of our fingers, hands, arms, shoulders, breathing, etc. that are required to play and play well. If you feel your practicing is not getting you anywhere then you are not practicing correctly and may be doing more harm than good. You may become frustrated and discouraged, develop bad playing habits and think the guitar is not for you. Actually, as simple as it sounds, you just need to know how to practice to get good results. I'm a beginning guitar student and write from that prospective. All those content lessons tell you what to do but not how to do it. 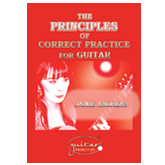 If you can't control your fingers and cause them to do what you want them to do you need to know and follow the Principles of Correct Practice for Guitar as developed by Jamie Andres. As a beginner I highly recommend the book and DVD with that title. It is the only instructional material I have found that explains and demonstrates the physical aspects of learning to play the guitar. We need the knowledge, skills and exercises to develop the correct use of our fingers and hands that are contained in the Principles of Correct Practice. It works for everybody regardless of experience or so called "natural ability". Get this book. You will be glad you did. Great book for those who want to learn how to play guitar from step 1. Easy to learn, easy to follow. I would recommend this book to the novice and expert. Thank You!!!!! 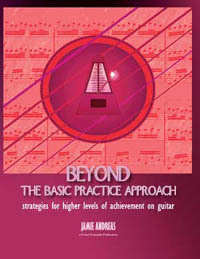 THIS BOOK CONTAINS INSTRUCTIONS THAT WILL HELP THE GUITARIST TO AVOID HABITS THAT CAN LIMIT THE EFFECTIVENESS FOR PLAYING AT MORE ADVANCED LEVELS. I ALSO RECOMMEND THE VIDEO THAT IS SOLD ON THE AUTHORS WEBSITE. IT IS A USEFUL AID TO THE INFORMATION THAT IS PRESENTED IN THE BOOK. THIS TRAINING IS WORLD CLASS!!!!!!! I teach electric and acoustic guitar professionally, and all my students are required to have a copy of this book. The book is now in its second edition, having been completely re-designed with new photographs and artwork. The text and typographical problems of the first edition have been eliminated. I like this book because it produces measurably better results for my students. Many of my students consider themselves "hard to teach" because they have non-standard cognition, unusually large or small hands, or physical injuries that make it hard for them to play. 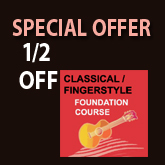 Since I offer a money-back guarantee to all my private students and don't reject a student simply for having a condition that makes learning the guitar difficult, my financial interests depend on me finding and using the best possible techniques to ensure my students make measurable, predictable, and repeatable progress. I truly can't afford to rely on the talent of my students and to let the students with less natural aptitude fall through the cracks. So far, this book and other books by Jamie Andreas have been my ace in the hole. Using the techniques and exercises in this book, particularly the Foundation Exercises and the Basic Practice Approach, I've been consistently getting results no matter how "hard to teach" or "untalented" a student may appear to be. Each student still learns at his or her own pace and there's a relationship between the amount of effort a student puts in and the results she (or he) achieves, but based on my teaching experience the methods in the book do yield measurable, predictable progress for everybody. This is what makes the Principles approach a reliable pedagogy: it provides a conceptual framework for instruction and doesn't rely solely on the natural aptitude of the individual learner. The book discusses how the human body learns and remembers physical movement, and it shows how to exploit the body's own learning process ("muscle memory") in order to train new movements quickly and efficiently. Everything is presented in the context of the body and on maintaining as much relaxation as possible. Written from a very analytical perspective, the book is well received by people with a math, science, or engineering background. Trying to learn guitar solely from books isn't something I recommend, however my students who are highly verbal, syntactic learners tend to do well when reading the instructions for an exercise and then doing it. The more visual learners benefit from doing it the other way around: demonstration, then explanation as to "why" something works. They generally use the instructions in the book as a memory aid when practicing at home, because otherwise they tend to skip steps. Even the students who truly don't learn well from books (due to diagnosed dyslexia, ADD, etc.) benefit from the pictures and the step-by-step Basic Practice Approach chart. To someone who has had the benefit of competent instruction, a few of the concepts and exercises in the book may appear to be "common sense" because they will be taught by any competent teacher. Examples include the necessity of sitting up straight and maintaining as much relaxation as possible. 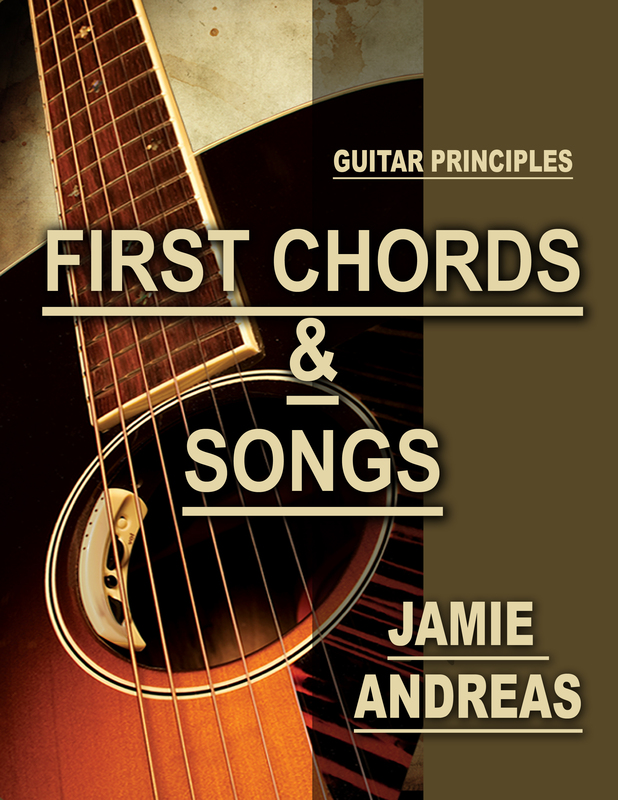 However, the book is marketed to beginners, and nothing about playing the guitar is natural or obvious to someone who is completely self-taught and who doesn't have the benefit of a teacher or another guitarist in the family. Were these "obvious" and "common sense" elements to be skipped or glossed over, as they are in many method books, the book would not be suitable for beginners. The exercises in the book focus on rudimentary foundations that are even more basic than the chord and arpeggio exercises found in most method books. This means that the book is not style-specific. It is just as useful for a rock guitarist as it is for a finger-style folk player. The book does contain both finger-style and pick-style development exercises, although most of the pictures are of acoustic guitar players. The average ten-year-old is capable of reading and understanding the book, assuming a certain level of proactivity. However the book is very dense content-wise and there's a lot of information in it. So I generally assign just a few pages at a time and introduce no more than one or two exercises per lesson. I then immediately show the student how the exercise applies in a playing situation. Each exercise is illustrated and described in minute detail. 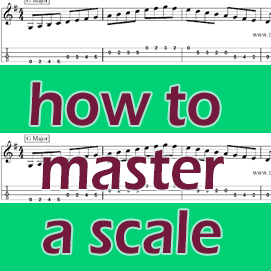 To work through the entire book, doing all the exercises and discussing each tool, technique, and concept, takes the average beginner student four to six months assuming half her (or his) time is spent on repertoire and half is spent on technique. A more advanced student who perhaps has experience on a different instrument may progress through the exercises more quickly. Highly recommended for really professional results! This is a required textbook if anyone wants to be able to play music on the guitar without obstacles . Only 000.001 % of the world's population can learn guitar successfully alone. The infinitesimal number of really good players speaks for itself. Students need proper training in how to think like a good guitar player. This type of thinking is highly complex or everyone would play guitar just like they wish. But they simply cannot...until now. The principles is the only book to my knowledge that actually puts every learning step into clear focus and tells you how to practice it. Where other books get vague and unspecific the principles gets to heart of the technical matters at hand with step by step how-to guidance that has proven to be highly effective worldwide in any style. The Principles allow you to learn to play anything you desire- with the necessary work- Be realistic! and don't fall for the common idiotic lies on the media: In other words: If you want to be a world class virtuoso expect to practice 4 to 11 hours daily for 5 to 10 years. But for those who want to play in a band or write songs or accompany themselves, it becomes possible to do so in a about year or less with the principles systematic approach and a minimum of 1/2 hour of practice every day. The guitar is- in-spite its popularity- the most complex instrument to master technically bar none. Other instruments require more force or limb independence but none has the devilishly intricate technical complexity and microscopic minutiae that baffles 90% of those who try to really succeed as they had hoped for. This is why so very few amateurs can actually play songs from beginning to end with any sense of musicality and delight. I found nothing unusual or hard to read about the book's literary style or type size. The printing is as professional as any books I have...and the paper is top quality. This book takes the time to explain to the intelligent reader how the book's content works psychologically and physiologically. It is a book for those who are into the guitar for the right reasons and want to really master the way to practice the instrument to the point of excelence and beyond. I agree with the reviewer that compared it to a Bruce approach because it is fundamentally the same way to mastery. Tai Chi also comes to mind. As a practitioner of martial arts I can see the commonalities and why they work so devastatingly well on the guitar. The BEST Guitar Instruction Book Ever Written! In my honest opinion, this book is the BEST guitar instruction book ever written. It delves into the fundamentals that lay the foundation for guitar excellence--fundamentals that most guitar instruction books never even mention. 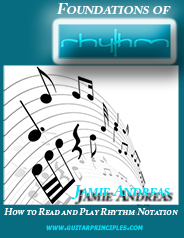 The book features techniques that enable a student of any level to begin to practice right and play right. It teaches anyone to be a better player through a systematic approach to focused practice and self-awareness that enables the player to identify sources of tension and identify and correct playing problems so that real growth can occur. 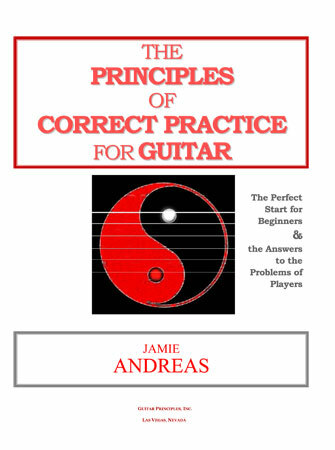 I consider the book to be "must reading" for anyone taking up the guitar and I would never recommend any student go to any guitar instructor who has not read this book and incorporated its principles into his or her teaching. I have no financial interest whatsoever in this book--I just feel really strongly about this book being the single most valuable book available for anyone who wants to learn to play the guitar, improve their own level of proficiency, or teach anyone else to be a better guitar player. The principles is the only book to my knowledge that actually puts every learning step in focus and tells you how to practice it. Where other books get vague and unspecific the principles gets to heart of the technical matters at hand with step by step how-to guidance that has proven to be highly effective worldwide in any style. The guitar is- in-spite its popularity- the most complex instrument to master technically bar none. Other instruments require more force or limb independence but none has the devilishly intricate technical complexity and microscopic minutiae that baffles 90% of those who try to really succeed as they had hoped for. Those days are coming to an end! The principles is saving larger and larger numbers of aspiring players from the common fate of never quite being able to play the guitar fluidly, easily, musically and naturally.. I love this book!! I've been using it for over two years and made tons of progress. I went from struggling with the most basic chords to successfully teaching rock guitar and playing the music I love. Do yourself a favor : get it, use it, and start enjoying a steady improvement in your technical skills. I highly recommend it to any musician looking to get better!!! Thanks to Jamie Andreas for generously sharing these secrets, that's priceless! I think this book is excellent and a must-use (not must-read, more on this later) for any beginning guitarist or for any experienced guitarist who are finding it hard to play better, especially the self taught. 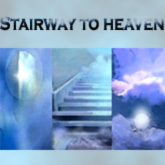 There are thousands of books, dvds, cdroms, and internet sites that will bombard you with chords, scales, songs, etc. that will tell you WHERE to put your fingers and WHICH strings to strike. But they almost always don't give a hint on HOW to train them to do it the best possible way, or just barely mention it without stressing it enough in the best cases. This book is completely on the other side of the spectrum. You won't find a single chord, note, song, etc. I can only recall the author barely mentioning a C chord once. But you will learn how to practice the exercises found in other books, and how to spare you a lot of problems when trying to reach higher levels of playing from the beginning of your learning process. You won't learn to play guitar using this book alone. You need either another book or, better yet, a teacher. 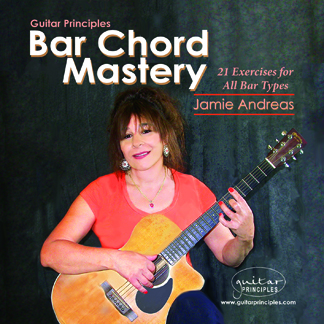 If you are using a book or an interactive method (that's what I am personally using) to learn the guitar, do yourself a big favor and get Jamie's book. 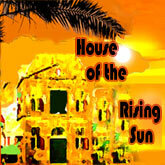 This book is not to be read from beginning to end and then put aside. Maybe the first time. But then you must use it constantly, reviewing the material several times, and jumping from section to section depending on the particular problems you are encountering at some point understanding why you are doing the exercises and then actually doing them, otherwise you won't benefit from it. It is not a compilation of exercises, as the author doesn't wan't you to just go blindly exercising your muscles, she wants you to understand why they must be done so you can commit to them. They are also not to be done mindlessly, the author asks not only for your physical effort, but your mental and emotional effort too. If you think you are capable of putting this effort into your playing and if you WANT to do it, then buy this book, otherwise don't bother. The exercises are both mental and physical. I found that they do help my "real world" playing. I had been playing for 14 years before picking up this book, and majored in Music performance. 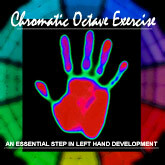 So I can say that although the exercises are basic, they were, even to me, helpful. I play rock, metal, blues, and some jazz. The exercises helped my single line playing.